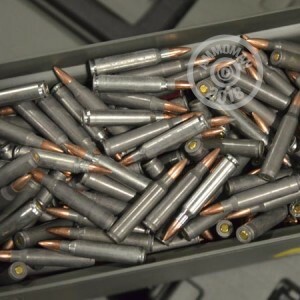 5.56x45mm Mixed Lot Steel Ammo With Ammocan! 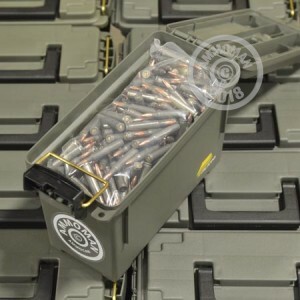 You'll receive 12 Pounds (Approximately 300 Rounds) of mixed lot, steel cased 5.56x45mm Ammo, loose packed in a reusable 30 Cal Plano Ammocan. All lots will contain a unique mix of range and defense ammo, in a number of different bullet weights, from a variety of manufacturers. Due to the loose-pack nature of this product, we cannot guarantee round counts or weight but we have tried to give you a conservative estimate of what to expect. On occasion, packaging becomes damaged while being moved around our warehouse and we can no longer ship the product as "new ammo" because of the cosmetic flaws. In the vast majority of cases, the ammo inside the box remain unblemished and unharmed. Rather than toss this quality ammo out, we've decided to give you this opportunity to score a bunch of rounds for a fraction of their typical price. Please note, while we are close on the amount in each ammo can, we cannot guarantee the weight or round count of each individual box.